The holiday season is right around the corner. And even though there are plenty of parties and good times to be had, there is also no shortage of holiday stress. 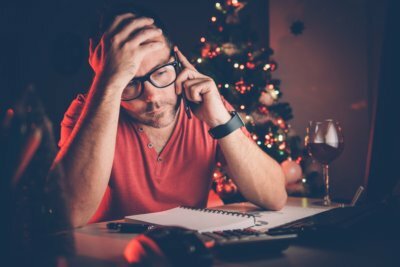 Thanksgiving and Christmas can be pretty polarizing times, but whether you’re celebrating or battling the holiday blues, staying stress free can seem like a real challenge. You may be short on cash or time, or have to travel across the country or spend time with a brother-in-law you just can’t stand—you’ll likely be faced with stressful situations. In fact, some 62% of American report their stress levels as “very or somewhat” elevated during the holiday season. Thankfully, dealing with stress during the holidays might be easier than you think. There are plenty of lifestyle tips and supplements you can use to help you stay healthy and make the most out of the next month. There are two essential things to think about when it comes to holiday stress management. The first is how to prevent wear and tear on your body during this busy season. Not only is it cold and dark (depending on where you live), but there are other factors that can break you down, including a lack of sleep and limited exposure to sunlight. Add those to the fact that junk food and alcohol are more present, and your immune system is on blast. Finding shortcuts to stay healthy is the best way to keep you powering through. Next, it’s important to think about how to deal with the things you just don’t want to do. The commitments, shopping, traveling, eating and perhaps spending time with undesirable company can all wear you down. If you know what you’re dreading, we’ve got some holiday stress tips to help you make it through. Depression and anxiety are common during the holiday season for multiple reasons. For starters, if you live in a region that experiences cold, dark winters you’re at risk for seasonal affective disorder (SAD). It’s estimated that SAD affects 20% of Americans, usually setting in just before Thanksgiving. SAD can be responsible for the holiday blues and makes people feel depressed and anxious throughout the season. It generally lasts until spring when it brightens up and the days get longer. Although the origins of SAD aren’t entirely understood, there is reason to believe a lack of sunlight exposure plays a major role. When you’re not getting sunlight, it means your body is not getting enough vitamin D, a nutrient closely associated to a number of health conditions including mood and depression. If vitamin D levels are insufficient or deficient—as they likely are for people who live in cold, dark places—it can contribute to anxiety and depression. The media often paints a really happy picture of Thanksgiving and Christmas, but reality doesn’t always shape up that way. This time of year can be a real challenge for people and lead to the holiday blues. The truth is that many spend the holidays alone, missing departed or geographically dispersed loved ones, or struggling mightily to extract any enjoyment from the season in general. In some cases, it can be the result of simply not getting along with your family. Perhaps there are years of emotional baggage stored in the towns or homes you’re returning to. There may be unresolved issues with fathers, aunts, or mothers-in-law that make it hard to enjoy the season. Dealing with these people can lead to stress and anxiety and diminish the experience of the holidays. Holiday stress is also common for people who love the season. These people can get bogged down by commitments and simply trying to do too much. Getting the house ready for parties, attending parties, hitting the shopping mall and trying to be everywhere at once can be taxing on the immune system and lead to stress and anxiety about not having enough time. Trying to be too perfect over the holiday season can be a big-time stressor! In the same vein, getting wrapped up in the commercialism of the holidays can lead to emotional and financial stress. Buying gifts for everyone and wanting to make sure your loved ones get exactly what they want can put a lot of added weight on people during Christmas, and can be a major source of holiday stress. Alcohol is also a major player in holiday depression, both for those who enjoy the holidays and those who struggle through it. Alcohol is a depressant, and no matter who you are, it will likely lead to an overall decrease in mood and boost in anxiety. You may not notice it at the Christmas party when you’re dancing and chatting the night away, but the following days can offer a big drop off. Alcohol also leads to bad decisions regarding food, which can contribute to inflammation and a lack of quality nutrition that can help improve mood. These impacts contribute to holiday stress and depression whether you’re celebrating the season or coping through a troublesome time. The food options can be another contributing factor to stress during the holidays. Food is in no short supply in the period from Thanksgiving to Christmas. And much of it, unfortunately, is not good for you. Navigating the decadent spreads at the family gatherings and other parties is essential to giving yourself the best chance at dealing with stress during the holidays. Poor food choices during the holidays can alter your gut bacteria, which is closely tied to serotonin release and regulated mood. To keep moving and limit stress during the holidays, the first thing to remember is to maintain your healthy habits. Unhealthy fat- and sugar-loaded Thanksgiving meals, Christmas feasts, and all the parties in between are actually pretty easy to manage if you don’t let them throw your lifestyle for a serious loop. So if you exercise regularly, eat a healthy diet, and practice other healthful habits, stick to them. Go for walks after meals; get to the gym between shopping; and choose fresh, whole food options when you can, and you should see diminished stress. The reason? A healthful diet and regular exercise are two of the best things you can do to squeeze out stresses. Go over your holiday plans and stick to them. Remember, they shouldn’t feel like a burden, so if there is one you’re dreading, don’t go. Unless it’s something you absolutely can’t miss, there is no reason to add to your stress levels this season. Take a look at which events you want to attend and which ones you should pass up, and then consider your approach to each. Are there two events taking place on the same weekend or week? Decide at which one you’ll consume alcohol. Don’t want to be tempted by sugary holiday treats? Then eat a full meal or fiber-rich snack before heading out or bring something healthy with you. After all, the stress and sickness caused by holiday eating can only happen if you’re going overboard regularly. Indulging at the Thanksgiving or Christmas table won’t throw you off the rails. Financial planning is also an important component for the dealing with the stresses of holiday shopping. To keep your finances in check, come up with a budget and a list of who you’re buying for and stick to it. Limit stress by shopping early (and on a full stomach), and learn to live with it if a particular item cannot be obtained. After all, the season isn’t about gifts—it’s about spending time with loved ones. If the holidays are lonely time for you, think about reaching out to friends, family, or other members of your community whom you’d like to spend time with. Social contact—with people you enjoy—can improve mood, limit stress, and make the season more enjoyable. Because the holiday season can be very stressful, it has the ability to wear your body down. Making sure your immune system is strong and up to the task can help you cope with stress, reduce the chance of illness, and make sure you get the most from the season. These supplements can help boost your immune system, improve sleep, flush toxins from the liver, and provide overall support for your system that lowers stress and encourages optimal health and function. Talk to your doctor about taking them for the season; then, you can decide whether or not to continue once life has returned to normal. Sure, you may not like talking to your sister’s fiancé or battling your mother over every last thing that comes out of her mouth, but that doesn’t mean you have to let them ruin your holidays. If you have a big family, try your best to avoid the people you don’t like and who add stress to your life. If quarters are a little closer and avoidance is impossible, make some adjustments to how you’re going to let things affect you. When you sense that your mother is baiting you for an argument, don’t engage. Make a joke and change the topic, compliment her hair, or do something to lighten the mood so there are no explosions at dinner. The same thing goes for the future brother- or sister-in-law; if they’re blurting out offensive comments at the table that make you want to get physical, don’t engage. Enjoy your dinner and save your thoughts for your like-minded family members! To make this de-escalation easier, be sure to act accordingly—limit alcohol and one-on-one time with these toxic individuals. It’s possible that the shorter days, darkness, and cold temperatures are leading to increased feelings of stress during the holiday season. The first thing to try is vitamin D3 supplementation. If you enjoyed plenty of outdoor exposure in the summer, this is the time of year when it starts to run out and blood levels get low. And one of the symptoms is elevated stress and anxiety. In fact, vitamin D blood levels are closely related to mood. Talk to your doctor, and it may be worthwhile dosing 1,000 IU or more per day. Some treatments for SAD include light box therapy, tanning outdoors, vitamin D3, and exposing yourself to natural light as often as possible—even opening the shutters in the morning can help. The holiday blues can grip you in a number of ways, but they don’t have to define your holiday season. You can have a relatively stress-free Christmas by taking advantage of these holiday stress tips and doing what you can to stay healthy and happy. By focusing on holiday stress management you can get the most out of the season and take the power back! “Seasonal Depression,” Cleveland Clinic, 2017; https://my.clevelandclinic.org/health/articles/seasonal-depression, last accessed November 15, 2017. Cannell, J., “Is vitamin D a modifiable factor in some cases of seasonal affective disorder?” Vitamin D Council, November 13, 2015; https://www.vitamindcouncil.org/is-vitamin-d-a-modifiable-factor-in-some-cases-of-seasonal-affective-disorder/, last accessed November 15, 2017. “Simple, Inexpensive Remedies for Seasonal Affective Disorder,” Mercola, February 14, 2015; https://articles.mercola.com/sites/articles/archive/2015/02/14/seasonal-affective-disorder-vitamin-d.aspx, last accessed November 15, 2017. Stewart, A., et al., “Possible contributions of skin pigmentation and vitamin D in a polyfactorial model of seasonal affective disorder,” Medical Hypothesis, Nov. 2014; 83(5): 517-525; DOI: http://dx.doi.org/10.1016/j.mehy.2014.09.010. Oliver, G., et al, “Stress and Food Choice: A Laboratory Study” Psychosomatic Medicine 62:853–865 (2000); https://s3.amazonaws.com/academia.edu.documents/5897754/nve_oliver_et_al._2000.pdf?AWSAccessKeyId=AKIAIWOWYYGZ2Y53UL3A&Expires=1510946067&Signature=wrmylC7SXRAIGrZNzuUfLq8Qrsg%3D&response-content-disposition=inline%3B%20filename%3DStress_and_food_choice_a_laboratory_stud.pdf, last accessed November 17, 2017. Naidoo, U., “Nutritional Strategies to ease anxiety,” Harvard Medical School; April 13, 2016; https://www.health.harvard.edu/blog/nutritional-strategies-to-ease-anxiety-201604139441, last accessed November 17, 2017. Fox, K., “The influence of physical activity on mental well-being,” Public Health Nutrition: 2(3a), 411–418, 1999; https://pdfs.semanticscholar.org/52ca/aa44f4ab2278d7558da6f13140052f485af9.pdf, last accessed November 17, 2017. Bergland, C., “Face-to-Face Social Contact Reduces Risk of Depression,” Psychology Today, October 5, 2015; https://www.psychologytoday.com/blog/the-athletes-way/201510/face-face-social-contact-reduces-risk-depression, last accessed November 17, 2017. Dibaba, D., et al., “Dietary Magnesium Intake is Inversely Associated with Serum C-reactive Protein Levels: Meta-analysis and Systematic Review,” European Journal of Clinical Nutrition, 2014; 68(4):510-516. doi:10.1038/ejcn.2014.7. King, D., et al.,“Dietary magnesium and C-reactive protein levels,” American Journal of Clinical Nutrition, June 2005; 24(3):166-71; https://www.ncbi.nlm.nih.gov/pubmed/15930481, last accessed October 23, 2017. Barnes, Z., “Magnesium, an invisible deficiency that could be harming your health,” CNN, January 3, 2015; http://www.cnn.com/2014/12/31/health/magnesium-deficiency-health/index.html, last accessed October 23, 2017. Intermountain Medical Center, “Specific vitamin D levels linked to heart problems,” ScienceDaily, November 9, 2015; https://www.sciencedaily.com/releases/2015/11/151109160556.htm, last accessed October 23, 2017. Schwalfenberg, G., “Vitamin D for influenza,” Canadian Family Physician, 2015; 61(6):507; https://www.ncbi.nlm.nih.gov/pmc/articles/PMC4463890/, last accessed October 23, 2017. Chow, B., et al., “Factors Affecting the Absorption of Vitamin B12,” American Journal of Clinical Nutrition, July 1958; 6(4):386-393; http://ajcn.nutrition.org/content/6/4/386.extract, last accessed October 23, 2017. Skerrett, P., “Vitamin B12 deficiency can be sneaky, harmful,” Harvard Medical School, May 4, 2017; https://www.health.harvard.edu/blog/vitamin-b12-deficiency-can-be-sneaky-harmful-201301105780, last accessed October 23, 2017. Maher, P., “The effects of stress and aging on glutathione metabolism,” Ageing Res Rev, May 2005; 4(2):288-314; https://www.ncbi.nlm.nih.gov/pubmed/15936251, last accessed October 23, 2017. Edwards, S. “Holiday Stress and the Brain,” Harvard Medical School; http://neuro.hms.harvard.edu/harvard-mahoney-neuroscience-institute/brain-newsletter/and-brain-series/holiday-stress-and-brain, last accessed November 17, 2017.